I'm a modern day recluse living on the verge of the Great Smoky Mountains National Park. 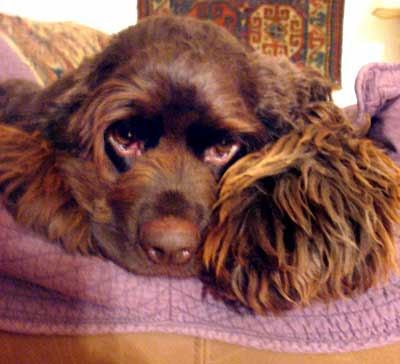 I'm a writer, dairy goat farmer and have a Cocker Spaniel rescue. I write in the genre of Southern fiction and non-fiction, primarily about the Appalachian people. I'm a southern girl, born in Savannah, GA and gently raised in the lowcountry of South Carolina. I'm a gun-toting progressive liberal Democrat. 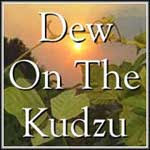 ...is up on Dew on the Kudzu. You may read it HERE. I hope you enjoyed it. I need to write more short story length work. Flash is so addictive, satisfying like dark chocolate, that it's hard to give up. I have a cold. A bad one. I'm pitiful. I've been awfully sick many times in my life. The thing about being seriously ill is that you don't care about things. You lose interest in everything that is important to you. And because of that--you feel very numb, even in the midst of unbelievable pain and physical trauma. What's what's so sadistic about the common rhinovirus, is it makes you feel like you imagine you would feel if you were dying. Sort of an imaginary sense of dying--but trust me--dying doesn't feel nearly this bad. It's scarier, but not nearly as miserable. This, they should put me in a coma for. ...on Dew on the Kudzu. "The Ghosts are Dancing" is a story I wrote some time ago loosely based on the flood of 1972 that struck the Hartford/Grassy Fork area. It's a long one, so Idgie has been running it through the month of February. Would of let you know sooner, but I forgot it was out there and scheduled to run. There should be another one tomorrow. This flood weighs heavily in the minds of everyone who lives here and lived through it. Everyone has vivid memories of it and I collected many of the stories from local residents to get a feeling for what it must have been like. The flood wiped out every single bridge in the area. Livestock washed away ten miles from where it lived. They say it was a freak rainstorm that hit "The Gulf" and washed everything away down Big Creek. This was what the old women told me when I was a girl. The dog came to the man and said, “Build a boat for a great deluge is coming.” So the man built the boat for his family to ride out the great storm. The water rose until it covered the tops of the mountains. When the waters receded, the man and his family built a fire in celebration. They heard in the night, drums beating in the distance. They went to look, happy others survived the great flood. But all they found was a great pile of human bones and they realized--the ghosts were dancing. I have a story just up on the new issue of Up the Staircase. "Tandava" was inspired by the deceptively sweet looking canine (I say sweet looking, but you can clearly see he has mischief on the brain) above. Well...him and a host of relationships I've had that eventually, literally, went to the dogs. Dogs in stories are like dogs in movies or dogs on stage or dogs just about anywhere. They steal focus. Everyone loves a dog story. You just can't help it---dogs make stories that make you smile, cry, laugh or react in a purely visceral manner. Cats are more thoughtful, subtle story devices. You know they are up to something, you just never figure out exactly what. Dogs, though--dogs are obvious, wysiwyg animals. Their pratfalls are almost always slapstick and foreshadowed. But the coolest thing about dogs is that when one is your friend, you always have a willing conspirator. A being who will goad you on to do your worst--and unerringly say you are the very best, most brilliant, most sublime person on the face of the earth, whatever foolishness you have just committed. Whatever egg is drying on your face. Whatever lover has just walked out of your life. The dog will still be there. Wondering if you taste like chicken. Aaargh! Enough with the snow already! I wake up this morning to 50 mph winds and blowing snow. It's already snowed more this year than it ever has since I came here seven years ago. Of course, I'm in the tiny little tail of this storm that is wagging over the NC/TN border. I have always loved the winters here. There's a certain Zen beauty to the bareness of the mountains. The stark gray-green forests--misty, linear outlines marching steadily toward a vanishing point. Who knows what's beyond that? Some dark glade where In the Hall of the Mountain King is playing softly and a troll gnaws on a human femur, no doubt. Friend Scott used to get dreadfully depressed here during the winters. He would be full of dark stories and imagine "Three-Toe"--the monster purported to live in his dreary little holler--scraped at his bedroom window. The mountains always have a little bit of magic, whatever time of year--sometimes dark, sometimes whimsical, always dangerous. But even I am not immune to the darkness this winter has wrought--I find myself trapped in my little cabin as the snow piles up outside thinking dark, Friend Scott thoughts. Okay, not exactly Friend Scott thoughts--he's always so over the top about everything and I'd need to be seriously depressed to get that dark. But I do wonder sometimes if there is an end to this cold. I can't envision the warmth of spring or the apple blossoms at Carvers. I feel like throwing a fit. I feel like raging at the sky. I feel like the end is nowhere in sight and serious magic must be brought to bear to end this frigid winter. I don't know anyone who drives a Toyota but I can only imagine how awful it must be to be looking at your mild-mannered Japanese import turned serial killer in your garage--wondering when it's going to cut you up into tiny pieces and stuff you in its trunk. It must be very stressful to have one of these cars about now. I go pick up my paper down the driveway today. I'd taken a drive because we were without power for most of the day (I know, big surprise). I was cold. It's Thursday's Newport Pie Hole--it's delivered late in the day and The Pie Hole isn't all that urgent a paper that it's important for me to read it hot off the press. It's a dish best served cold. And a little soggy. Of course, Newport would put it's own spin on the Toyota thing. Yes, that's right. A 2008 Camry LE ran amuck on the streets of Newport and of all the places it could have attacked, it chose the funeral home. Ran itself right into the lobby. Of course, it could have been much more serious. There could have been a casket with a body the car hit, throwing the body up into the air so it landed in a crowd of horrified mourners. The immediate family might have screamed out the deceased's name and the funeral directors would be so shocked that their pleasant expressions might have slipped. Finally, the evil, possessed vehicle might have come to rest right in the middle of a "Jesus Calls" floral arrangement--it's spinning wheels spraying crushed mums and lilies all over the place. None of that happened, of course. But it could have. The driver is okay so, yeah--I'm snickering a bit. It's just so Cocke County. I've got a new story out on DecomP's new and improved site. It looks great and while I was expecting this story out in January, it's well worth the wait to be on such a handsomely designed page. I'm in good company with fellow Zoetropers Ethel Rohan, Bonnie ZoBell...and many others. It's is one of my "ships in the night" stories. I keep revisiting that theme for some reason. There's probably some submerged psychological reason for that. I wrote the story for a dear, dear friend, who gets dearer by the day. I hope you enjoy Cold Dark Matter. Haven't seen hide nor hair of the groundhog that lives in the big woodpile in my pasture, but the turkey "herd" saw Max this morning (and he saw them) resulting in great flapping of wings, gobbling and outraged turkey flight. It will be six more weeks of miserable cold, drizzle and slush. Or not. I hope my firewood holds out. The turkeys group in small groups, I've noticed, during the early fall--then they seem to gather in one huge turkey conflagration (I made that up--but it sounds like it might be right. A conflagration of turkeys). Even the white turkey I saw earlier in the season is with them. So, about forty of them were in the "bowl"--the steep hollow in front of my house. Max jumped into the midst of them like a kid into a pile of leaves and damn, those suckers can fly! Not at all like my guineas, geese or chickens used to. I'm still left with the question as to why they are so hard to hunt when they are so careless in the road or field when I see them. I could have easily murdered one of them, even with the sights of my .22 being all messed up.